O&O Syspectr is a web app for managing Windows systems over the internet. To do this, the computer being managed needs to have a program installed that will connect it to our servers. Never miss an important event on your Windows systems. As soon as something happens, you will receive a notiﬁcation and you can react immediately, even when you’re on the road. You have access from everywhere simply over your browser. Manage your systems from your Smartphone, Tablet, Notebook or from your Desktop PC. Whether it’s the current status of your software, hardware, windows security or if you need to run a script or connect with a remote PC or server: O&O Syspectr has it covered, and more. Management with O&O Syspectr takes place over a web browser. Every current browser on every internet-capable end device can be used. As usage is based entirely on HTML5 there is no need for additional software or Plug-Ins. The same applies to the remote desktop which also operates entirely over a browser. 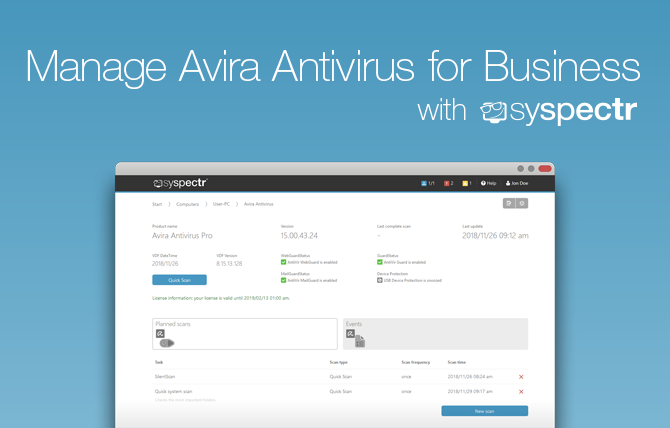 NEW: Manage Avira Antivirus over the O&O Syspectr Console! We are delighted to announce the release of a brand new Avira Antivirus Module in O&O Syspectr, thanks to a partnership with the company Avira! Install, manage and monitor Avira Antivirus on your PCs and Servers through the intuitive console O&O Syspectr! O&O Syspectr gives you the tools and a simple, intuitive dashboard to update your Avira Antivirus, centrally scan updates and jobs and stay fully informed of the safety of your devices across an enterprise network. In the rare event that an endpoint is ever unprotected, or if a scan or update fails or an error occurs, the console will alert you so that you can take care of it. Simply register at O&O Syspectr and log in. In the Avira Antivirus Module in O&O Syspectr, enter an existing license for one of the supported Avira products or purchase the required licenses over O&O Syspectr from Avira. After activating your Avira license (s), you can install the Avira client remotely on the desired computers and select installation options. From now on, Avira’s customary scan options and benefits are available, from a fast scan to individual comprehensive scan plans. Avira protects people across all devices, both directly and via their OEM partnerships. They provide a wide variety of best-in-class solutions to enhance protection, performance, and online privacy — ranging from antivirus to VPN and cleanup technologies. As a pioneer of the Freemium business model, they have grown into a 500-strong multinational company that protects the digital lives of millions of users worldwide. Read more here. Register now – Setup takes less than ﬁve minutes: register, install it and you’re done. O&O Syspectr is ready to go in 5 minutes: Create account, install the client, done! In addition to internet access, no additional infrastructure is required. Suitable for organizations of all sizes. The admin interface is suitable for desktops, smartphones and tablets. Once this is done, the necessary system information will be transferred and saved, available for you to then see and access over your account. During transmission and storage of your data, it will be encrypted and secured using the latest standards. O&O Syspectr supports every Windows system from 7 and Server 2012 R2. O&O Syspectr itself is free, your only costs are for new or extended Avira licenses. In order to access the Avira module, simply click on settings under your monitored computer, select “Modules” and activate the Avira Module with one click. Register for O&O Syspectr nowIt’s Free!